THE PALACE CIVILISATIONS OF CRETE IN MAINLAND GREECE ARE BUILDINGS THAT ILLUSTRATE PHENOMENAL ARCHITECTURE AND ARTISTIC DESIGNS THAT ARE DISTINCTIVE WHEN COMPARED TO SURROUNDING ASIAN AND NEAR EASTERN STRUCTURES (BRANIGAN, 2004). The uniqueness and complexity of these palaces raises a series of questions about their purpose/s as to why substantial amounts of time and effort went into creating them. 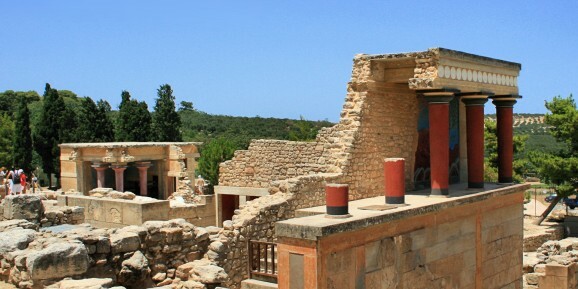 By assessing the archaeological evidence at each of the main palaces at Knossos, Mallia, Phaistos and Zakros and comparing them to surrounding communities, this question can be examined to understand their roles in society. Perhaps one of the more evident roles that palaces in Crete played was to house ‘so called’ members of royalty (Graham, 1969). By assessing the arrangement of these structures and the domestic quarters, magnificent ensembles of rooms were identified. This included what was inferred to be the royal families megaron and throne rooms (Cunliffe, 2001). Furthermore, the use of precious stones, grand staircases and elaborate columnar architecture all enforce the level of expenditure that was spent in their construction. Features of the palaces in the new period reflect their majestic nature, with colonnades; staircases connecting the several storeys, light wells serving the dark inner rooms and multiple doorways (Alexiou, 1969). Gypsum, quarried locally at Phaestos and Knossos, was used in the form of slabs for facing and covering areas of large floor and for the bases of doorjambs (Cunliffe, 2001). The roofs were typically flat but were constructed rafters and crossbeams where external faces were constructed out of limestone (Alexiou, 1969). It is from this structural evidence of Minoan palaces are thought to reflect a high dispersion of wealth and/or power within their society. This is because construction of such grand edifices is typically associated with authority or leadership spearheading the organisation of the workers. Material evidence within the palaces of Crete also suggest that there were rooms that were solely utilised for the storage of staple goods, such as olive oil, wine, cereals, saffron and coriander (Warren 1985). A prime example of this is at the palace of Knossos, called the west wing magazines area. This zone had 18 narrow storerooms that contained a thin, narrow passageway with thick, paved gypsum and plastered walls with no windows (Christakis, 2004). These conditions would have maintained very cool temperatures and ensured that it would have mostly remained pest free. Within these storerooms there was a total of 420 ‘pithoi’; large stone vessels which was able to hold approximately 550 litres each, indicating a very large surplus in containing goods that would have supported a large population (Warren, 1985). In addition, some of the pithoi identified were lead lined. Due to leads toxicity, it is assumed that these held items other then water or consumable goods. It has been surmised that these particular pithoi held luxury goods including tools and traded items (Momigliano, 1996). The others which were plaster lined thought to hold in it liquids (olive oil and wine), cereals, saffron and coriander major crops at the time (Warren, 1985). 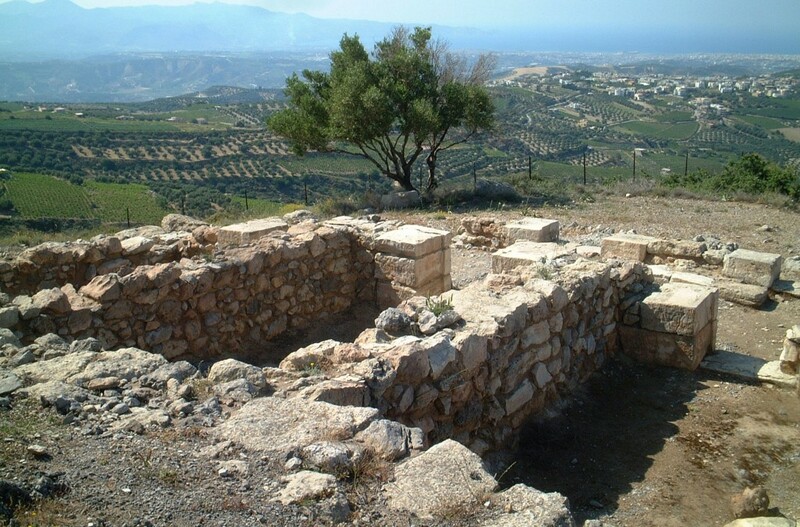 Palaces of Crete not only acted as a storage facility for agricultural goods. They were also a major customer for commodities that were provided by farmers or craftsmen within the wider community (Cunliffe, 2001; Willetts, 1957; Nosch, 2011). For example at Mallia, the houses and workshops neighboring the palace walls, would have heavily relied on the palace as a major customer. Initially, these small trades may have been independent, although through time this situation began to change where the craftsmen were controlled directly by the palace authorities and is issued with rations in return for a quota of work (Cunliffe 2001). The more transactions and exchange of goods resulted in a greater relationship between the craftsman and the palace. This association also benefited the prosperity of new palaces. In particular, as the community became more reliant on this reserve of food more labour was allocated to building or improving the cities infrastructure. This exchange would have been crucial for the establishment of the Minoan economy throughout Crete. One of the more controversial topics is thought to be whether the palaces acted as a site of international trade as they moved into the New Palace Period. Ivory tusks, wood from Lebanon and ostrich eggs have all been located within palaces of Crete and identified as internationally traded items (Warren, 1985). In the Old Palace Period, finished products were also imported, such as Egyptian alabaster vases, scarabs and other types of Egyptian stone vessels (Warren 1985). While there is evidence for these internationally sourced goods, there is no solid indication that the palaces were initiating this trade. In addition, like local trade, there would be administrative records of international trade that, if they are present, have yet to be located (Knappett & Schoep 2000). The level of material culture in the form of figurines, pottery and illustrations are indicative of symbolic or social behavior within the Minoan palaces (Wright, 2004). Firstly, throughout the palace there is significant evidence for social gatherings through artistic depictions of feasts, dance and religion (Day & Wilson, 1998). This is reflected in images in the palaces, examples being mountain goddesses multiple reflections of varying vessels displayed in Linear B (Alexiou, 1969; Wright, 2004,). Further evidence for ritualistic behavior is the presence of alters and tablets within the palace walls. For example in the lobby of the stone seat at Knossos, tablets were found in the throne room and record the name of deities that offerings were made in worship of (Christakis, 2004). Christakis 2004 argues that these items were used as proof for the purification or the collection of goods for religious purposes. Tripartite shrines has also been located at Phaistos and consists of three close adjoining rooms, where behind these rooms another room is located which has clay tables set into the floor (Alexiou, 1969). On the table there are offerings with a central hollow with libations poured onto it. In the same shrines there is also benches and a variety of utensils used in preparation for the ritual. Adjacent to these rooms there is trenches that have been located with evidence of ashes and animal bones indicative of animal sacrifice (Alexiou, 1969; Shapland, 2010). This arrangement is also evident at the Palace of Knossos where crypts have also been identified in the West Wing (Alexiou, 1969). The palaces were also thought to act as a central court for Minoan Bull Sports. Both at Knossos and Mallia buildings have been thought to act as grandstands from which the community of the palatial town watched young athletes being tossed by the bulls (Alexiou, 1969). 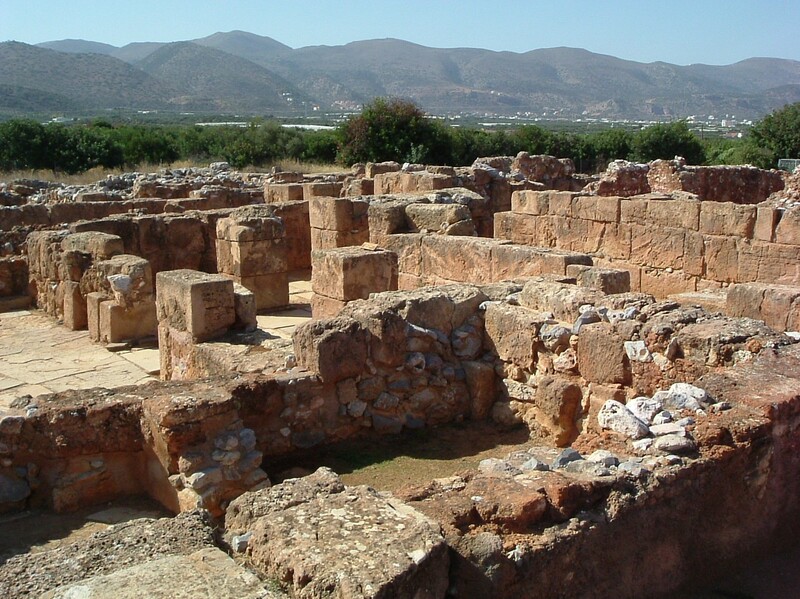 The palaces of Crete act as central place within their town utilised for a variety of purposes, providing the bases for continuing prosperity within these communities. These purposes were identified by archaeologically examining the palatial remnants at Knossos, Mallia, Phaistos and Zakros. Post initial investigation four primary roles were recognised; representation of social hierarchy, site for storage of staple and non staple goods, central point for local and international trade and place of ritualistic and social practice. Alexiou, S 1969, Minoan Civilization, Heraclion, Spyros. Branigan, K 1970, The foundations of palatial Crete: A survey of Crete in the Early Bronze Age, Routledge & K. Paul, London. Christakis, KS 2004, ‘Palatial economy and storage in Late Bronze Age Knossos’, British School at Athens Studies, vol. 12, pp. 299-309. Available from: JSTOR [02 September 2012]. Cunliffe, B 2001, The Oxford Illustrated History of Prehistoric Europe, Oxford University Press, New York. Day, PM & Wilson, DE 1998, ‘Consuming power: Kamares ware in Protopalatial Knossos’, Antiquity, vol. 72, no. 276, pp. 350-358. Available from: ProQuest [02 September 2012]. Graham, J., 1969, The Palaces of Crete, Princeton University Press, New Jersey. Knappett, C & Schoep, I 2000, ‘Continuity and change in Minoan palatial power’, Antiquity, vol. 74, no. 284, pp. 365-371. Available from: ebsco [02 September 2012]. Momigliano, N 1996, ‘Evans, Mackenzie, and the history of the Palace at Knossos,’ The Journal of Hellenic Studies, vol. 116, pp. 166-169. Available from: <http://dx.doi.org/10.1017/S0075426900022916> [02 September 2012]. Nosch, MLB 2011, ‘The Mycenaean Administration of Textile Production in the Palace of Knossos: Observations on the Lc(1) Textile Targets’, American Journal of Archaeology, vol. 115, no. 4, pp. 495-505. Shapland, A 2010, ‘Wild Nature? Human-Animal Relations on Neopalatial Crete’, Cambridge Archaeological Journal, vol. 20, no. 1, pp. 109-127. Available from: < http://dx.doi.org/10.1017/S0959774310000077> [02 September 2012]. Warren, PM 1985, ‘Minoan Palaces’, Scientific American, vol. 253, pp. 94-104. Available from: Cengage Learning Inc. [02 September 2012]. Willetts, RF 1957, ‘Some Elements of Continuity in the Social Life of Ancient Crete’, International Review of Social History, vol. 2, no. 3, pp. 421-448. Available from: < http://dx.doi.org/10.1017/S0020859000000973> [02 September 2012]. Wright, JC 2004, ‘A Survey of Evidence for Feasting in Mycenaean Society’,Hesperia, vol. 73, no. 2, pp. 133-178. Available from: ebsco [02 September 2012].